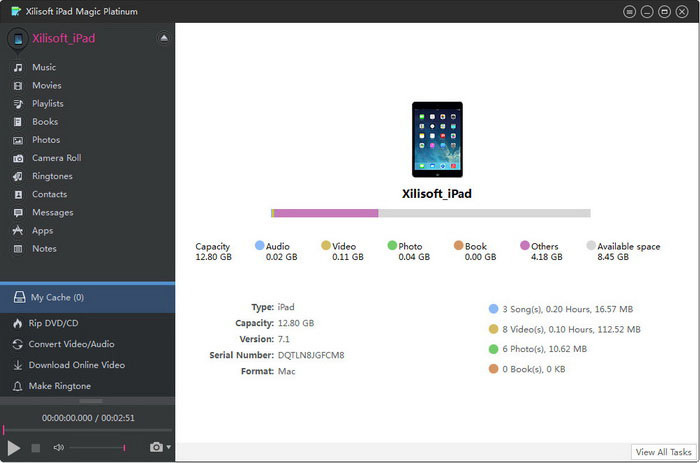 Xilisoft iPad Magic 4 is an all-in-one iPad solutions provider which helps you to manage your iPad in full-scale: backup music, movies, photos and books, transfer files from PC to devices in high-speed, convert 3GP/CD/DVD/audios/videos to iPad/ iPod/iPhone music/movies, download and convert online videos from top online video websites. With Xilisoft iPad Magic you can easily convert 3GP to iPad. Download iPad Magic (for free) , fellow the tutorial and start converting MKV to iPad. Click on the "File" button in the menu and click "Add File(s)" button to add 3GP files to the task list. The files will be listed on the interface.